Peel the pears, leaving the stalks in place and remove the cores. Place the sugar, water, lemon, orange and wine in a saucepan over medium heat and stir until sugar has dissolved. Increase heat and simmer for 5 minutes. Add the pears and allow to simmer, covered with a square of parchment paper, in the liquid for 15-20 minutes or until tender. Remove from the heat and leave to cool in the liquid for at least 2 hours or the next day is best to allow the flavours to infuse. In the meantime, prepare the chocolate sauce. Add the cream to the saucepan and bring to a gentle boil. Break up the chocolate and place in a heat proof bowl. Pour the boiled cream over the chocolate and stir gently to make a sauce. Keep covered with cling film and warm until needed. To serve, fan out the pears, leaving the stalks intact. 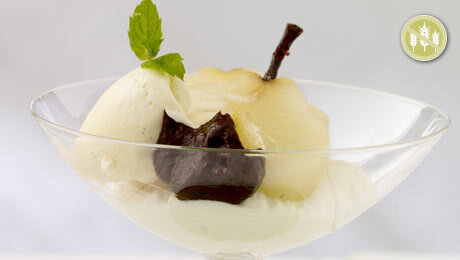 Arrange a cocktail glass, add some whipped cream and the fanned pears. Drizzle a little of the chocolate sauce over each one – the remainder can be served in a small jug separately. Served with oodles of your favorite ice cream.